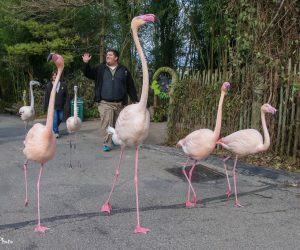 This blog is part of a series of guest blogs by our Zoo Academy students. To learn more about the Zoo Academy program, click here. Hello, my name is Kyle Abel and I’m an 11th grade Zoo Academy student. The Zoo Academy is a special high school where students can do different activities around the Zoo, called labs, as part of their school day. In my Education lab, I do a variety of different tasks with the many different members of the department. 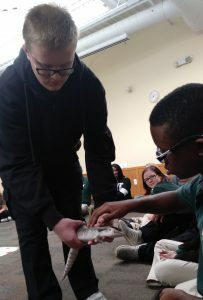 Those tasks include Interpretation and Storytelling, Curriculum and School Programs, and Animal Handling, which is where I met a blue-tongued skink named Marvin. 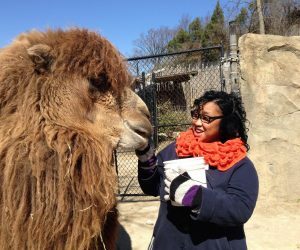 Animal ambassadors like Marvin educate Zoo visitors on animals found around the world. 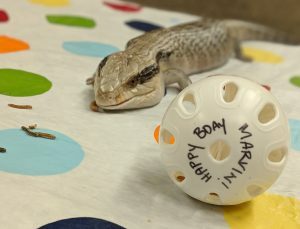 Marvin can teach them about the importance of blue-tongued skinks like him. Marvin’s species originated from Australian habitats of grasslands and underground burrows. 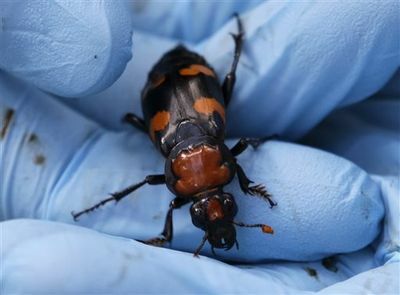 They are 16 to 20 inches in length and can live up to 10 years in the wild or 20 years in human care. They use their signature blue tongue as a defense against predatory birds and mammals that like to eat them. They like to eat crustaceans in the wild and like to eat pinkie mice and collard greens at zoos. One interesting thing about them is that female skinks can retain eggs inside their bodies and as many as 25 babies are born live, which is called ovovivipary. Ovovivipary is a form of reproduction in which the eggs develop within the mother’s body without additional nourishment from the parent and hatch within her or immediately after laying. I enjoyed this animal so much because Marvin was the first animal I ever handled at the Cincinnati Zoo and got to present him to the entire class of Zoo Academy students in the process. 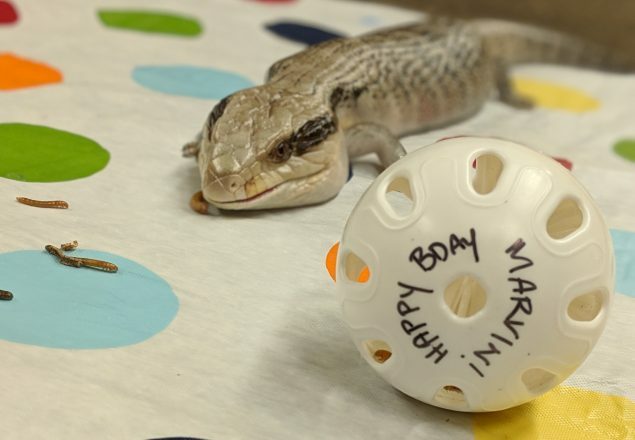 I think you should care about him because Marvin turned 21 years old on December 15, 2018 and will be the first skink, that I know of, to break the milestone of the amount of years they can live in human care. On his birthday, I created a special enrichment for him to enjoy as well. Enrichment is something you add to an animal’s life to keep their mind and body active. I hope I was able to teach you something about the blue-tongued skinks and why you should care about them. Next time when you’re wandering around the zoo and see somebody holding a funny looking lizard, don’t forget to say hi to Marvin and ask how he’s doing. I’m sure he would really appreciate the company. I had heard of skinks before, but didn’t really know much about them. Thanks to Kyle’s blog post, I have done further research and find the skink to be fascinating! Keep up the inquisitiveness, Kyle! I have a friend who had a skink for thirty-two (!!) years. She was absolutely devastated when it died, as you can imagine. I think think that the Zoo Academy is a great opportunity and am happy that you can participate Kyle.